Joining an embroidery club, guiild or group is a terrific way to make new friends, who share you interest in needlework and embroidery. You can join one of the groups listed here, or create yoour own local group. The Embroiderers' Guild of America, Inc., (EGA) is a national non-profit educational organization offering study and preservation of the heritage and art of embroidery, including needlepoint, cross stitch, drawn thread, crewel and surface embroidery. Membership is open to all, whether they have a local chapter nenarby or are members at-large. The Embroiderers' Association of Canada (EAC) is a national non-profit educational organization whose purpose is to have a fellowship of persons who enjoy needlework and wish to learn and share their knowledge; and maintain higher standards of design, colour and workmanship throughout Canada. Their aim is to preserve traditional techniques and promote new challenges in the Art of Embroidery through education and networking. The National Academy of Needlearts (NAN) is an organization devoted to the advancement of embroidery as an art form. Its goal is to uphold the highest standards in the needlearts by providing excellence in education to all those interested in furthering their embroidery skills as teachers, judges, artists, designers, authors, and technically proficient embroiderers. The Royal School of Needlework is the international center for embroidery teaching based at Hampton Court Palace in south-west London. Their mission is to teach, practice and promote the art of hand embroidery to the highest standards, within both historical and contemporary design contexts. The Royal School of Needlework offers a range of courses suited to both the beginning, leisure stitcher through to advanced classes for professional, master stitchers. The Embroiderer's Guild, based in the UK, offers educational opportunities for all styles of embroidery. It has 10,000 Members, 195 Branches, 650 Young Embroiderers, 2 Magazines, Museum Collection, International Tours, Courses, Reference Library, Competitions, Events, 4 Annual Newsletters, and a Members Forum. An Austalian group, their mission is to "To promote, preserve and encourage all aspects of embroidery by providing a venue for embroiderers to meet, classes to be held and heirloom pieces to be collected." Start your own club. 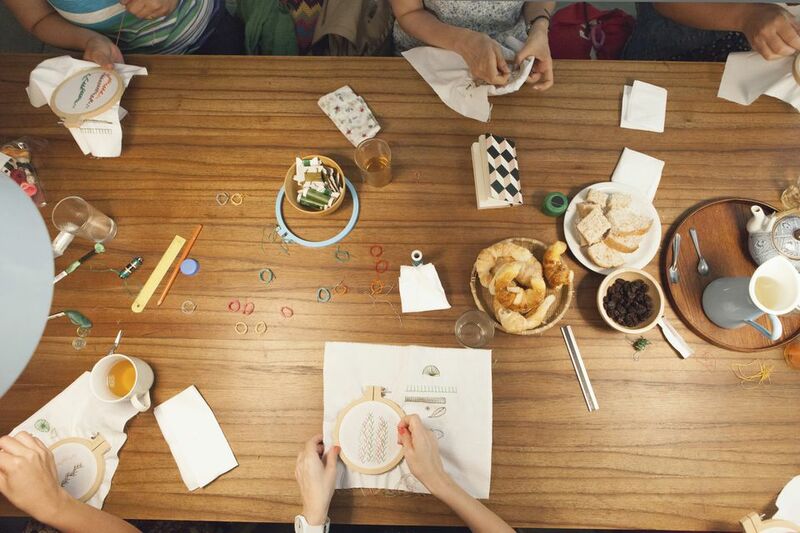 Cross Stitch Guide Connie Barwick shares her tips for creating your own local group.